The Duke's Course was designed by five-time Open champion Peter Thomson CBE, and has been highly regarded since its opening in 1995. 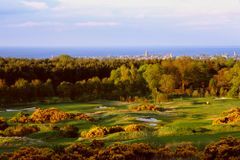 However, with Herb Kohler's recent takeover of the Old Course Hotel and the Duke's, there has been significant investment, designed to enhance both the layout and the drainage of the course. Kohler plans to hold major professional events at the Duke's and the improvements reflect that desire. Played from the tips, this is the longest golf course in Scotland, and it represents the perfect accompaniment to the classic tracks at St Andrews Links. It is a parkland course, but Kohler has toughened it up, especially the bunkering which is now reminiscent of his other venture, Whistling Straits in Wisconsin, which hosted the 2004 USPGA Championship. Enjoying magnificent views down over the 'auld grey toon', The Duke's is a remarkable place to play a round at the spiritual home of golf. The Dukes is a quality championship course , not the easiest golf course but a true test of golf . The course was in excellent condition , with the greens not quite at their best due to the time of year ( end of March ) A delight to play . Owned by The Old Course Hotel, The Dukes Course is only about 7 minutes from the Ardgowan Hotel which was our base for our society golf tour in St Andrews. When you enter the gates you’re properly wowed going up the drive to the course. The scenery is beautiful at the Dukes, with the gorse in full bloom and everything about the place being very grand. The course is a great tree lined layout, which can get pretty testing as it’s quite tight at times and there are some long holes with a lot of gorse. All of the guys in our group loved the course even though some found it tough. Service in the super slick clubhouse is phenomenal too. Members of staff go above and beyond and the changing room is one of the coolest I’ve been in! Beers on the balcony overlooking the course after the round are a must!